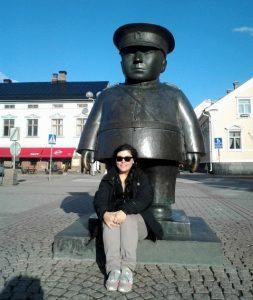 My name is Claudia Galdos and I live in the beautiful city of Oulu in Finland but I am originally from Lima in Peru. I am an Economist and currently doing my Master in Product Management at the University of Oulu but I’m also the creator of the Colectivo Blog. Colectivo means in Spanish a shared transportation (normally a bus of different sizes) that is used by many people at the same time and, I named this blog after it since it will be a source of shared information for everyone in the need of it. Something about me is that I started to travel since very early age -nationally (in Peru) and internationally as well- and I found myself fascinated about exploring new cities and creating a new perspective of the world –my world– and cultures. Beside of visiting amazing and unique cities is making unforgettable acquaintances and friendships from which many continue until these days. For several reasons, I ended up completely amazed by Finland and yes, I came in winter in my first trip! It may have been the magic of the snow or the darkness of the winter season or that unique atmosphere of peacefulness in dates nearby the Christmas day or the smell of just baked gingerbread cookies that make me fall in love completely with Finland, the city of Oulu and the amazing people. Sometime after my first visit -some years back now- I encouraged myself to come to study here, which I did when I was pursuing my bachelor degree. Once I graduated and added some work and entrepreneurial experience, I decided to continue my studies in the city where I felt as home before… Oulu. Ever since I returned to Finland, I challenged myself to create this blog to help even more people to have a wonderful experience while studying in Finland and especially in Oulu. As a student of the Oulu University, I will share with you all the different happenings and all the relevant information that you need to have for your time here as a student (exchange or degree), visitor or just passing by as a traveler. Thank you for reading this blog and keep on following it for more posts, updates, tips and lot of surprises that are soon to come! Do not hesitate to contact me here! N.B: I want to thank immensely -to the moon and back- to Dejafoo to make my dream come true and for the patience and dedication to make everything perfect! Thank you! Muchas gracias! Kiitos!